What Should We Do? Get 'er Done. The odds of finding a 4-leaf clover are 1 in 10,000. 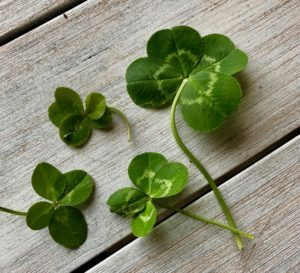 Finding a 5-leaf clover is even more rare, 1 in 1,000,000. Today when I stopped to tie my shoe during a run, I found a 4-leaf clover. About a half mile up the road, my ear buds fell out (thanks to my goofily-shaped ears) and when I reached down to pick them up, I immediately saw another 4-leaf clover, plus a 5-leaf clover. Add that to the 4-leaf clover I plucked by the Parthenon on Saturday’s run, and it equals an absolute statistical impossibility. And yet, here they lie on my table. Spring is my favorite time of year. It reminds me that we must let our paradigms of the past die in order to be reborn with a passion that sustains us into the next phase of life. Some people spend a lifetime searching for that passion, but we have the choice to decide what we can do with any given day. We have the power to pivot from the grind into gratefulness. We don’t need all of life’s answers to pick one thing we are passionate about and get into action. I’m proud for the various contributions I’ve made at work so far, like developing e-payments before PayPal existed, creating the world’s largest rooftop solar-powered community, and building innovation programs around the Internet of Things that were demonstrated at the White House, to name a few. After many long runs in the sweltering heat of the Costa Rican jungle, however, it occurred to me the most valuable thing I could do next with my time is to teach companies how to leverage and retain the unique contributions of all their employees. There are so many talented women and other minorities that can offer unique contributions to your company’s short and long-range growth strategies—and they’re right under your nose. Interestingly, the most common feedback I get when telling successful business leaders that I’m following this passion, and decided to develop an international platform to accelerate diversity in business is, “Well, could you find another word besides ‘diversity’—it’s just sooo polarizing?” The answer is, “Yes, I can. And it’s the dollar.” You see, the dollar is a universal language that any man, woman, black, white, brown, gay, or straight person understands. To create meaningful and sizable adoption, we must create business models that accelerate diversity and yield financial results. Our company, Cole Scott Group, has developed an international platform of business experts who will share a wide range of modern diversity solutions that increase profitability and boost innovation. We are bringing them together to speak with executives across the country and receive feedback about which tools will work most effectively. When you get the question from a colleague, an employee, a student, or even a family member, “With all the societal unrest going on in the world, What SHOULD we do?” Evaluate your own personal passion. You have the choice to make a positive, powerful difference. So…what are you waiting for? Get ‘er done.